An unlikely pairing, these two. Tomatoes and peaches, when at their prime, are both so juicy and flavorful that you need something crusty to soak up all those juices. Peaches get tucked under biscuit dough and baked up into cobbler. In this house, tomatoes have no finer place than atop a slice of toasted garlic-rubbed sourdough bread, drizzled with olive oil and sprinkled with flaky salt. These are noble dishes. They make intuitive sense. But rules are meant to be broken, especially in summertime, and this is the salad to do it. It is a big, summery bowl full of juice, and there's nothing to sop it up. (Spoiler alert: serve with crusty bread.) But the juice that gathers at the bottom of the salad bowl is the purest extraction of summer. It is elixir, and you will want to hoard it, and spoon it up, and drink it straight. Without excellent peaches and tomatoes, this salad isn't worth making. Splurge at the farmers' market. Or, if your local famers' carry discounted "second" fruit with blemishes, this is a great place to use them. Once they're cut and macerated, you won't notice little imperfections in the fruit. If you've got other ideas, don't hold back. Or, if you literally want to drink your salad, you can make it, and then puree it into a fantastic sweet-tart gazpacho. Chile and lime optional. Drink up, friends. Enjoy the weekend. Peel the peach using a peeler or a paring knife. Split in half down the dimpled pole of the peach, and pry the two half moons away from the pit. Cut each half into 4 slices, and then cut each slice in half. Transfer to a bowl with all the accumulated juices. Cut the tomato into similar segments: cut in half, cut each half into 4 slices, and halve each slice. Transfer to the same bowl with juices. Drizzle the olive oil over the fruit. Add some of the salt, and use a spoon to fold everything together without bruising the fruit too much. Taste, and add more salt and fresh pepper to taste. At this point, the salad is ready. It can rest happily on the counter until you're ready to eat, or you can gobble it all down immediately. Peel peaches. Cut into full slices, cut each slice into strips, and cut each strip into cubes. Size is your choice - I like itsy bitsy pieces for chips, but chunky hunks for tacos. Repeat with tomatoes, cutting into similarly sized pieces as the peaches. Dice the chile as small as you can. Combine everything but salt and pepper in a bowl. 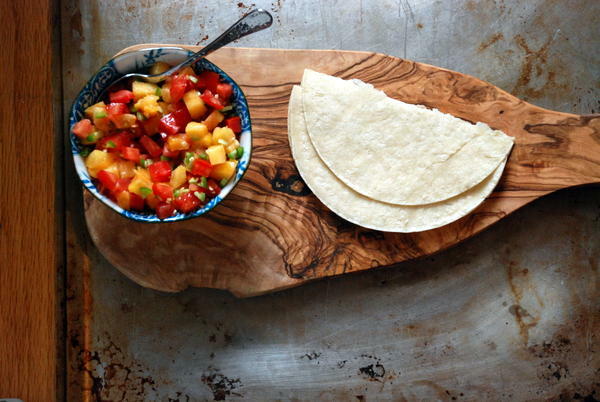 Add salt and pepper gradually, tasting as you go, until your salsa is balanced to your taste. Serve immediately, or let the juices accumulate for a while.